Let us paint the picture for you so you can feel the essence of Monferrato – the essence that is Barbera d’Asti. I often wonder how much thought people give to the origin of the wine in their glass – do they have a sense of place as they sit in their U.K. pizza restaurant with a bottle of Barbera d’Asti? Any images in their mind of the beautiful vineyard where the grapes are grown, or the care and hard work of the grower in the vineyard and the winery? I can’t help but think that if they knew more that it would enhance the experience for them. Images of both landscapes and people would surely breathe life into the glass. We see Barbera d’Asti frequently on wine lists in the U.K., both in independent and chain restaurants, yet I see little written about it, hear little spoken about it. And yet, Barbera is the life blood of Monferrato, an everyday reality. When I first visited Monferrato I was enchanted by the lush rolling landscapes, the order of the vineyards introduced amid the forests and woodland by the farmer, the grower, over the centuries. This influence of the hand of man, this perfect synergy, was instrumental in the recognition of Monferrato as a World Heritage Site by UNESCO. If we look more closely, we can see a wide variation in the terroir too, resulting in different styles of wine depending on site. This, of course, is currently topical in the Nizza DOCG appellation as the producers seeks to differentiate the different crus, as is common in Barolo and Barbaresco. Indeed I had the pleasure at Vinitaly recently of tasting different expressions of Nizza in a masterclass on this very subject. It was clear that the different vineyard sites did indeed result in subtle variations worthy of classification. Let us return to the diner, eating his pizza or pasta and drinking Barbera in a small town or big city restaurant in the U.K. Is it possible to bring the region to life for this consumer? Perhaps they might look for Barbera in a search engine on their smartphone. What will they find? I know from the many Twitter chats that I have hosted over the last few years that consumers love a story. They love to hear about a winery, the people behind the wine. Family wineries are always popular but so too are the stories behind challenges, such as acquiring DOCG status, as achieved recently by Nizza, stories of the determination to improve the quality of wines, and stories of all moves to improve sustainability. Perhaps we can provide this background, this vision, through this mynameisbarbera website. I have a good friend in the U.K., Jim, a regular participant of my Twitter chat, who lived and worked in Piemonte for many years. Now retired, he still loves to talk about his time there, and indeed travels back often with his lovely wife to revisit old haunts, old friends, and old favourite wines. His fondness for the Piemontese is clearly evident. He told me once that he finds the friendly people of the region very humble, shy and reserved, a little hesitant about shouting to the world about their great wine. Well perhaps this is where I, and other overseas wine writers can help. Let us do the shouting! Let us get the message to the regular wine drinker, with his or her pasta or pizza on an evening out with friends or family. The wine in your carafe, my friend, comes from one of the world’s most beautiful wine regions, a UNESCO World Heritage Site. Let us show you the images, the landscape, the grapes. 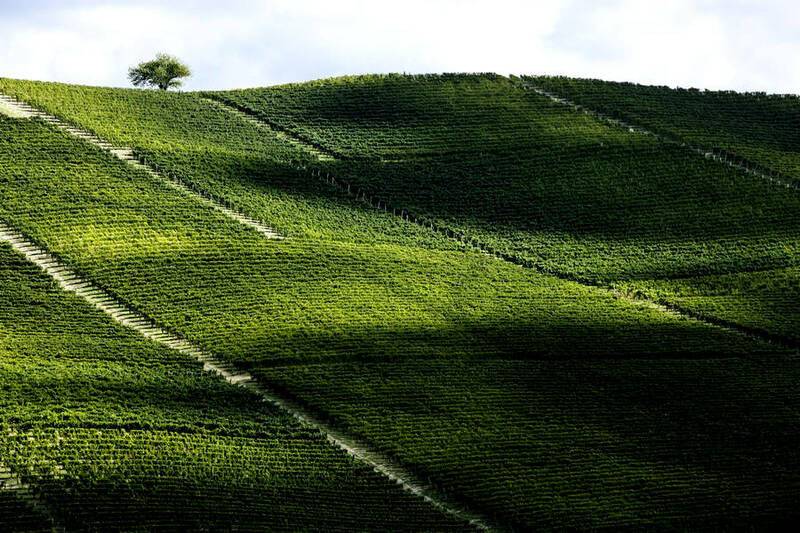 Let us paint the picture for you so you can feel the essence of Monferrato – the essence that is Barbera d’Asti.